As promised, here's another pumpkin recipe, this time using just the seeds. The seeds pictured below were the ones I excavated from our Halloween Jack O'Lanterns (a.k.a. "field) pumpkin & also a "pie" pumpkin that I recently used for cooking. Although I wouldn't recommend cooking with Jack O'Lanterns (they can be kind of tough & thready), the seeds are, of course, very good toasted. 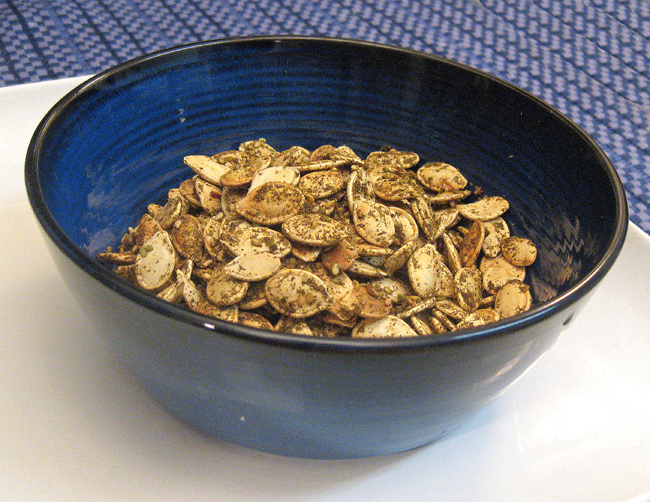 Directions: Pour lemon juice & pumpkin seeds into a bowl, thoroughly coating seeds with the lemon juice. Then sprinkle za'atar on top & again, coat thoroughly. Spread out pumpkin seeds in a single layer onto an aluminum-foil coated metal pan (for easy clean-up) and cook in the oven on 160-170ºF for about 15-20 minutes, or until a very light golden brown. (Cooking them at a low temperature helps to preserve their healthy oils.) After about half-way through baking (about 10 minutes or so), be sure to shake the seeds a bit, &/or move them around with a heat-proof utensil, to flip them over & keep them from sticking to the aluminium foil. Watch the oven carefully as the seeds tend to burn easily. Let cool. Serve immediately or store in a non-reactive, airtight container for future use.